More reviews of things that taste like other things! This time I have some light and crispy waffle-style chips from H-Mart that are supposed to taste like pizza. 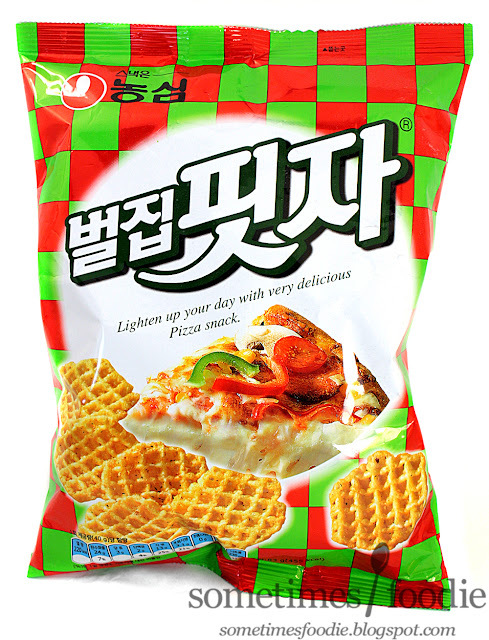 I'm a bit skeptical, so far I haven't have anything that recreates the flavoring of pizza as well as actual pizza, but I still wanted to give these a try. The packaging is colorful and obnoxious. We have a bright green checkered with a bright red, but thanks to the large white spaces, this comes off more Italian than Christmas-y. The photos are really nice, and I like the overall layout, but that background makes this look like a cheaper product. I feel like if it were slightly muted the overall look would be a lot classier, but then it wouldn't stand out on the shelves. The bright and obnoxious coloring is what originally caught my eye, so it might be garish, but it works well from a marketing standpoint. I opened up the bag and I can smell fry oil, canned pasta sauce, and some Italian herbs. The aroma isn't very pizza-y, unless you mean school cafeteria pizza, and the crisps are lovely puffed waffle shapes. 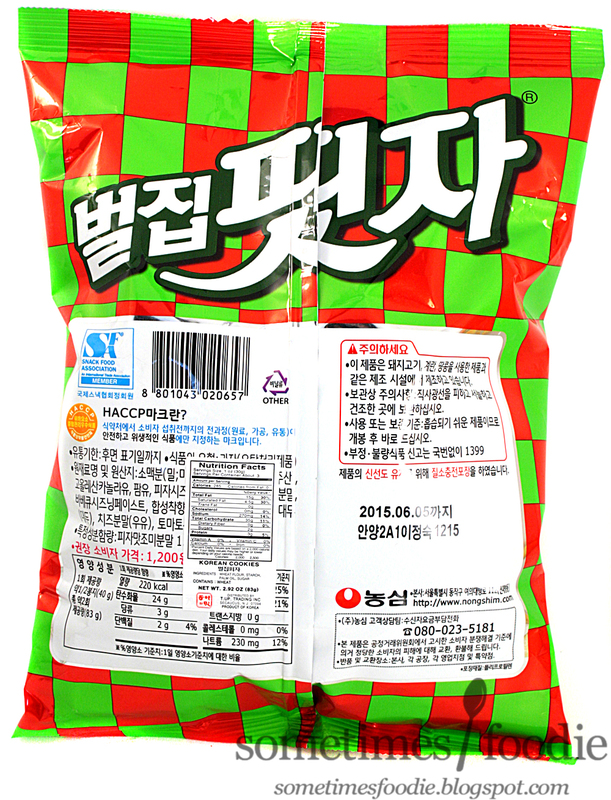 The texturing for these is very similar to crunch of those crab flavored snack discs I bought a few years ago. They're crispy and light, but also a bit styrofoam-y. 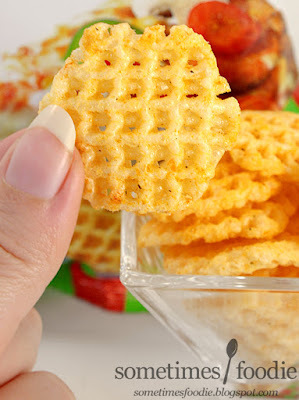 It seems like a lot of the fried snacks I buy at the Asian markets have this texturing. It's not off putting, but it is very different from the crispy crunch of fried American cheese curls and snacks. Now for the taste test, do these taste like pizza? No. No, they do not. The flavoring on these is more like a sweet tomato sauce, similar to Spaghetti O's or ketchup, with a hint of oregano and garlic. These do not taste anything like an actual slice of pizza, which is disappointing. Then again, I wasn't really expecting these to be authentic. For what it is, it's pretty okay. 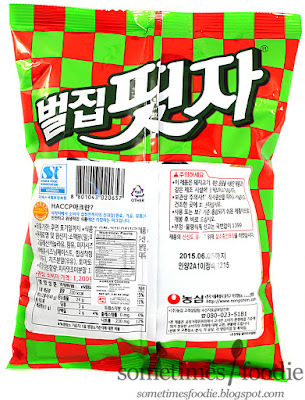 As I ate more and more of the crisps I found there was this spicy sensation building up towards the back of my mouth, which was really nice, but the overall flavoring is sweet-tomato-sauce. Which is not what I look for in a pizza. 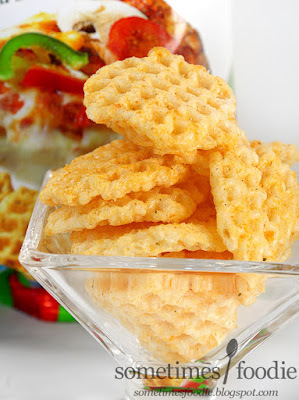 I really like the shape of these, and the idea behind them, but they just don't taste like pizza, and I feel like eating these is going to give me heartburn. If you're one of those people who really enjoy ketchup flavored potato chips (which I am not), you might enjoy these. I personally didn't enjoy them, but I would try this product again if I find another flavor.